Feb 12, 2012. Sierra Emperor: Rise Of The Middle Kingdom download free. Many more foreign hostages than originally reported were taken by the Al Qaeda terrorists at the Amenas gas plant in Algeria. The Algerian government says that 100 out of 132 were freed, and some sources say that 30 or more hostages were killed. The British government offered the Algerians manpower, equipment, and expert assistance to expedite the resolution of the crisis, but was refused. American, British, and French nationals are thought to be among the dead. In other news, the latest figures from Angola indicate that at least 250,000 Chinese nationals have migrated to the country. The Angolan government says that work permits were issued for the Chinese to assist with development projects. To see the headlines and the articles, open. Thanks to Andy Bostom, C. Cantoni, DS, EG, Insubria, JD,, Mary Abdelmassih,,,, and all the other tipsters who sent these in. Notice to tipsters: Please don’t submit extensive excerpts from articles that have been posted behind a subscription firewall, or are otherwise under copyright protection. Commenters are advised to leave their comments at this post (rather than with the news articles) so that they are more easily accessible. Caveat: Articles in the news feed are posted “as is”. Gates of Vienna cannot vouch for the authenticity or accuracy of the contents of any individual item posted here. We check each entry to make sure it is relatively interesting, not patently offensive, and at least superficially plausible. The link to the original is included with each item’s title. Further research and verification are left to the reader. Note: Takuan’s post (which was originally published last night) is to remain at the top for a while, so I made it “sticky”. However, much has happened since it went up, including the Blogger outage. Scroll down for a. See also: Two forthrightly, in Germany, and of the Imran Firasat interview. More new posts will be added below this one. Oh, and don’t mess around with. The essay below is the conclusion of the ninth part in a series by Takuan Seiyo. See the list at the bottom of this post for links to the previous installments. Fireshot Crack Serial on this page. Left: Pierre-Auguste Renoir, Dance at Le Moulin de la Galette, 1876 Right: George Grosz, Metropolis, 1916/17 The Bee and the Lamb Part 9 (continued) By Takuan Seiyo A Whole New Road to Serfdom That Which is Not Seen (continued) For over 60 years, White mea-culpists have had a firm grip in all fields of cultural mind imprinting: education high and low; paper media, then electronic, then digital media; all forms of entertainment, the plastic arts and music high and low, and religious instruction and worship too. Their main endeavor has been to enforce their compulsory (e.g. K-12) and discretionary (e.g. Television) self-flaying on account of long-ago Slavery, Colonialism, Imperialism, Male Supremacism, Racism, Antisemitism, and so on. It’s the evils of the Iberian Inquisition — which were evil — but not the evils of the Japanese equivalent in which, in the 40 years up to 1597, 50,000 Christians were publicly crucified, burned or beheaded. Nor the evils of the worldwide Islamic Inquisition which — not in the 16th century but now, in the 21st, condemns Muslim apostates to barbaric execution. It’s America’s destruction of the snail darter but not Mussulmanism’s destruction of the Bamyan Buddhas or its proposed destruction of the, let alone its obliteration of all the pre-Rome cradles of Christianity but for remaining ruins in the Middle East and dust of the desert in North Africa. It’s the evils of feudalism and industrial workers’ exploitation in Europe and America, but not the strict Confucian evils of Northeast Asia. There, a member of the ruling class in China had, essentially, a free hand with anyone of the lower classes, a Japanese samurai could test his sword by cutting down an insolent peasant, and farmers were so squeezed by their fief holders that they habitually sold their daughters to bordellos for the few coins it provided for next season’s seed. One would be hard put to find a nation not based on the invasion of another people’s territory and their mass slaughter. Yet poisoned American madmen proclaim as though the Indians themselves did not fight endless genocidal wars from Peru to Canada, with torture, ritual murder or slavery for the captives and, at times, cannibalism too. Leftoid masochists and the Christian meek call for returning Hawaii to the Hawaiians and capitulating before a massive Mexican reconquista of one-third of America. The self-defined “Feminist-Tauist-NeoPagan-Post-Structuralist-Deconstructionist-Socialist” useful idiot Gillian Schutte begins her New Year 2013 by “wholeheartedly apologizing for what my ancestors did to the people of South Africa and inviting you to do the same.” Yet the Magyars don’t seem to feel much guilt over the Illyrians, Pannonians, Sarmatians and Celts whose land and lives they took in the 9th century, to form Hungary. The rightful Etruscan landowners are not bearing angry placards in front of the Vatican. The Japanese are not planning to relinquish Hokkaido to its original owners, the Ainu. The tall, white and fair-haired Chachapoyas of the Andean forest have, alas, no remnants left to sue the Incas for genocide in a Peruvian court of law. The Aztecs, whether in Jalisco or Los Angeles, don’t agonize over having taken what would become Mexico City from its original Culhuacan owners, with lots of grisly details. Yet for 38 years Neil Young has been reminding adoring audiences about “”, discreetly omitting and the killer people whom Cortez killed. Hitler’s Willing Executioners: Ordinary Germans and the Holocaust (1996) is a book by Daniel Goldhagen presenting the thesis that the German nation as such was composed of willing executioners of the Jews because of a unique “eliminationist antisemitism” in the German people, with long historical roots. However, even that great moral abyss of Western civilization — the Holocausts — stands out more in its industrialized and organizational features than it does either in the quality of its hatefulness or its relative or even absolute volumes. And Holocausts they were, for in addition to the nearly 6 million Jews, the Germans also murdered over 21 million civilian Slavs, and that’s counting Russia, Ukraine, Poland, Lithuania, Belarus and Czechoslovakia alone. In absolute numbers, the total number of World War II non-German civilian victims of Nazi Germany is smaller than the 50 million victims of the Bolsheviks in Russia, or Mao’s 70 million in China, or the Mughal-Muslim genocide of Hindus — the latter have their own Holocaust Day on August 14. In relative numbers, in just one year, 1994, the Hutus and Tutsis in Rwanda, killed off a total of one million, in a population of 7 million. 75% of the Tutsi population was erased. Is it more humane to go by a stroke of a blunt machete than by a whiff of Zyklon B? The Khmer Rouge murdered at least 2 million Cambodians between 1975 and 1979: one quarter of the population, by a conservative count. Is it more humane to die by wallops from a Cambodian pickaxe handle than by a bullet from a German Mauser? Inscription on the back (in German): “Ukraine 1942, Jewish Aktion, Ivangorod.” There is a special horror attached to the Third Reich, because those were 20 th century Europeans, Christians, and in many ways the smartest, most civilized people on Earth. But the Holocausts do not prove that Whites are worse than other people, just that they are no better. The history of the Third Reich also proves that with the right formula of economic blowup, misery and humiliation, sparked by charismatic evil, no people are immune to such horror, at no time. A big tip of the Bodissey pickelhaube to our commenter Jolie Rouge, who with a brand new acronym. The occasion was an observation about (the link only works in the UK): Andrew Neil and Michael Portillo are joined by former UN secretary-general Kofi Annan and Alastair Campbell. Interesting conversation — acknowledging the geopolitical threat to the West. Note the aggressor is not named other than by geographical location (e.g.) North Africa, Afghanistan and surprisingly the inclusion of Turkey. Amazingly they manage to avoid the JIM words — Jihad, Islam and Muslim. I think JIM could have great utility for our enterprise: it’s concise, pronounceable, handy to use, and easy to propagate. Who will be the first major Western politician (not counting Geert Wilders) to break the greatest cultural taboo of our time, and mess around with JIM? Tonight’s news feed is unusually fat, due to the inclusion of last night’s items, which were never used because of the Blogger outage. Download Driver Epro Internal Tv Tuner Card With Fm Pci. Yesterday a group of Al Qaeda terrorists assaulted a natural gas plant in Algeria and killed two foreigners while taking 41 other hostage. Today Algerian special forces staged a helicopter raid on the plant, killing a number of the hostages — between six and 34, depending on whose figures you believe — in the process of taking out the terrorists. Among the foreign hostages were American, British, French, and Japanese nationals. In other news, Germany has begun repatriating its foreign gold reserves, which are stored in vaults in Paris, London, and the United States. To see the headlines and the articles, open. Cantoni, Erick Stakelbeck, Fjordman, Insubria, JB, JD,,, McR,,, and all the other tipsters who sent these in. Notice to tipsters: Please don’t submit extensive excerpts from articles that have been posted behind a subscription firewall, or are otherwise under copyright protection. + Commenters are advised to leave their comments at this post (rather than with the news articles) so that they are more easily accessible. Caveat: Articles in the news feed are posted “as is”. Gates of Vienna cannot vouch for the authenticity or accuracy of the contents of any individual item posted here. We check each entry to make sure it is relatively interesting, not patently offensive, and at least superficially plausible. The link to the original is included with each item’s title. Further research and verification are left to the reader. Many thanks to our Spanish correspondent Hermes for the translation, and to for the subtitling: Transcript. We are in the midst of a Winter Weather Warning (also known as Crystallized Climate Change) here at Schloss Bodissey. That means I am watching big, fat flakes accumulating on everything — though the driveway is still clear. Prior to that, we awoke this morning to heavy rains. It is our good fortune that there was never any period of transitional ice. Thank heavens! Why am I talking about the weather, you ask? Because this heavy wet snow may well eventuate in a power outage. Should that happen we would have no way to tell you why when, once again, no one seems to be home. If the power does go out, I’m confident it won’t be for long. Our rural electric cooperative is exceptionally good at handling these kinds of weather ‘events’; if we do go out, it won’t be for long. And thanks to the generosity of our donors several years ago, we installed a gas cook stove so we can cook and have — thank heavens, again — hot coffee during the outage. Yes, we are careful regarding the possibility of carbon monoxide poisoning if we were to use the stove for heat. However, given how leaky our storm windows are, I’m not worried. Here’s what NOAA says. Yesterday we reported on a group of young Muslim men who accost pedestrians in certain parts of east London. They insist that their turf is a “Muslim area”, and require that non-Muslims observe the appropriate dress code and the Islamic proscription on alcohol while they are there. The included an embedded video taken by the group and posted on their YouTube account. Since then YouTube has yanked the video, on that it was “intended to harass, bully and threaten.” However, for the sake of the historical record of these dire times, has preserved a (slightly augmented) copy at MRC TV. As you all know by now, our blog was suddenly removed last night between 8 and 9pm EST for no apparent reason. I retain my “dashboard” account, as does Dymphna. And, as you can see, I still have the gmail account. There is no “deleted blogs” link on our dashboards, as there should be if the blog had been deleted deliberately through a normal procedure. Late last night I began the process that one always goes through with Blogger: we posted requests on the help forum. That’s really all that can be done; you can’t talk to human beings where Google is concerned. We actually received a response, which is unusual with Google. Based on the replies, there seems to have been a major problem with Blogger last night. Many other blogs disappeared in the same fashion. I anticipate that this is most likely a technical glitch on Google’s part, based on the number and types of blogs that had the same thing happen to them last night. But we should know for certain within another day or two. 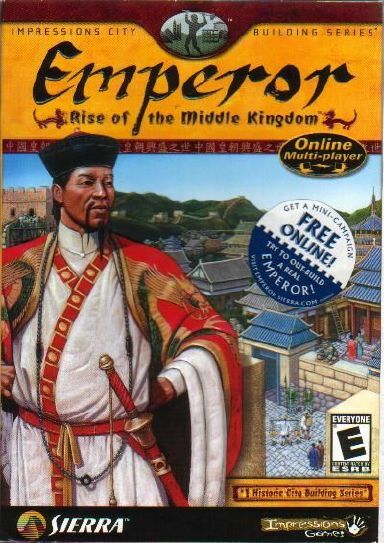 Emperor: Rise of the Middle Kingdom is the sixth title in the City Building Series. BreakAway Games was contracted for Emperor after having previously worked on Queen of the Nile. Emperor is the last of the series to use the same 2D-sprite game engine as seen in the earlier titles, and the first to introduce a multiplayer option. Not unlike the earlier games, Emperor focuses on the building and development of a city in ancient times, this time Ancient China, from the Xia Dynasty (2033 BC) to the Song-Jin Dynasties (1234 AD). The most basic task in each mission is to maintain the city. This involves keeping the populace well-fed, healthy, and safe from hazards. If food and basic goods and services are provided in abundance, the city will eventually improve. Beyond this, the player must manage trade and taxes in order to fund further development and expansion. In the meantime, the player may elect to make offerings to the ancestral heroes. Principally, offerings are made to appease the heroes and prevent them from becoming angry and inflicting disasters upon the city. But heroes can also be made very happy, which can prompt them to visit the city and confer benefits to it. Beyond the city itself, the player must pay heed to rivals and enemies. Troops and guards are necessary to protect the city from military invasions and subterfuge. The player can build defensive walls and man them with archers for improved defense. Eventually, the player may be required to build monuments, which are costly both in time and materials, giving enemies an opportunity to take advantage of possible weaknesses. As such, building a monument generally requires that the city first establish a strong economy and military. --------------------------------- This is in a rar, it requires no CD to play nor any iso programs to instal. It's very simple. If you have any questions tell me.